1. If your tattoo was covered at the studio, remove the covering between 30min and 1 hour after being tattooed. 2. Wash the tattoo using only the palm of your hand and antibacterial soap in luke warm water. Running water is best. Do NOT use a washcloth, as they are rough and cam damage the tattoo as well as they harbor bacteria that may lead to infection. 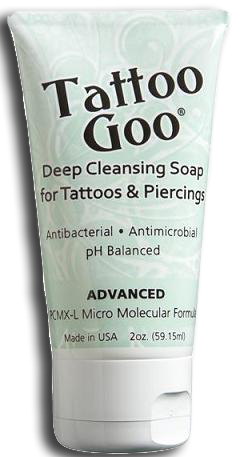 Wash your tattoo 2 – 3 times per day or anytime your tattoo gets dirty from work, sports, etc. 3. Lightly pat your tattoo dry using ONLY a soft paper towel. Do NOT rub. Do NOT use a towel as they can harbor bacteria just as washcloths do. 4. Apply a very thin coat of Vaseline, A&D Ointment, or Aquaphor to the tattoo. A thin layer is defined as being barely visible and not clumped on. Only reapply as needed and do NOT over-apply. Do this for the first 3 days. Do NOT allow your tattoo to become completely dry as this may lead to scabbing. 5. Switch to a non-scented lotion such as an all-natural cocoa butter, Curel Continuous Comfort, or if you were using Aquaphor, you may continue to use it throughout the duration of healing your tattoo. Continue using the lotion until your tattoo has stopped peeling and for a couple of days after. This may take up to 2 weeks, sometimes longer depending on your body’s natural ability to heal itself.  Your tattoo is a wound and should be treated as such in terms of keeping it clean and avoiding things that may potentially cause infection, allergic reactions, etc.  Avoid extended periods of direct sunlight or submersion in water during the healing period.  Do NOT go swimming during the healing process. Pools, rivers, lakes, ponds, oceans, etc may lead to protozoan, fungal, or bacterial infections.  Do NOT scratch, pick, or peel your tattoo. If it itches, lightly slap it a few times. This will usually stop the itching.  Let your tattoo peel at its own pace. Do NOT pull off loose bits of skin. By doing so you may pull out ink resulting in a touch-up being necessary.  Do NOT pick scabs from your tattoo if you developed scabs from allowing it to dry out.  Do use sunscreen on your healed tattoo when you intend to be in direct sunlight for extended periods. 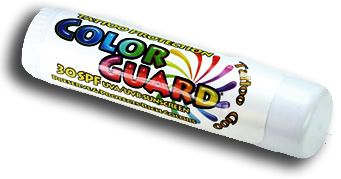 This will help extend the life of the tattoo and prevent color fading from sun bleaching.  Do NOT shave over your tattoo until it has completed peeling. If you have any small scabs and shave you may rip them off resulting in a touch-up being necessary.  NEVER put a triple antibiotic, peroxide, or any other antiseptic on your tattoo. This may potentially ruin the color in the tattoo and cause it to need to be redone.  Do NOT allow dogs, cats, or other pets to touch your tattoo. Pet dander may cause an allergic reaction to occur even if you are not allergic to the animal. Dander on a fresh “wound” may lead to infection as well.  Oozing during the first couple of days. This is normal and is usually a combination of the ointment you are using liquefying due to heat from the tattoo (tattoos get hot due to the increased blood flow to the area), excess ink being pushed from the skin by your body’s natural defense mechanism, and dead blood cells leaving the “wound’. o This should be gently patted off with a paper towel. Do not be alarmed by any ink staining on the paper towel, this is normal during the first few days.  Itching is perfectly normal, however you should never scratch your tattoo until it is fully healed (completed peeling on its own). Gently patting or lightly slapping the tattoo should relieve any itching. However if you have not just recently washed your tattoo, you may wash it in hot (not excessively hot, but comfortable) water. This will sometimes ease the itching as well.  Just as with piercings, tattoos have a tendency to get hot as mentioned above. This is not a sign of infection unless you have other symptoms of infection, which will be discussed below. The heat is due to your body’s natural healing mechanism that sends an increased amount of blood flow to the wound. 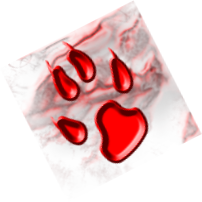  Along with the aforementioned heat, you will experience redness around your tattoo for up to a week afterwards. Larger tattoos have a tendency to maintain a pinkish to reddish tint around them longer than smaller tattoos due to the increased blood flow. This is normal and should not be considered a cause for concern.  Slight swelling of the tattoo and the surrounding area is also normal during the first few days to a week. This again is another part of the body’s natural healing mechanism and is mostly impart to the increased blood flow. The skin around the tattoo swells due to the skin reacting to the tattoo as a skin irritation. This will go away along with the redness, oozing, and heat after several days. The speed in which your tattoo heals is dependent upon several factors. Your overall health. Healthy people heal much faster than people who are slightly unhealthy or have immune system disorders. If you maintain a healthy diet, exercise, and care for your skin & body your tattoo will heal much faster than someone who does none of those things. If you have a decreased or suppressed immune system your healing time may be much longer than someone who does not. This is one of the reasons why people who have diseases that decrease their immune system should consult their doctor before being tattooed. Some Dr’s may prescribe an antibiotic regimen to take in the few days before getting tattooed and during the course of the healing period. If you have an immunity disorder you should make your tattoo artist aware before being tattooed so that they may guide you in making the right decision to tattoo or to wait until you have spoken with your Dr. and gained a medical OK. The level of care that you give for your tattoo. Just as you would not have major surgery and not follow aftercare directions for healing for your wounds, you would not get a tattoo and not care for it. Tattoos are wounds and should be treated as such in terms of cleanliness and protection. Wounds heal best when slightly moist and this is why you have been advised to maintain a light coating of ointment during the first 3 days and lotion for the remainder of the healing time. When a wound becomes dry, it can be susceptible to a whole host of problems. Scabbing, cracking of the scabs, and excessive soreness are easily prevented by following the aftercare directions above. In addition to keeping your tattoo moist, it must be kept clean just as any other wound. If you work in an industry where your tattoo will get dirty or be exposed to chemicals, your best bet is to keep it covered with a light cotton clothing item to prevent excessive exposure. However, remember to allow to it breathe frequently and DO NOT reapply ointment to a dirty tattoo. Rubbing the ointment on will rub particles into the tattoo and put you at risk for infection. The quality of the tattoo when it is done. The term “heavy handed” often applied to some tattoo artists usually refers to the fact that they “dig in” a little more than necessary. This results in more damage to the skin, an extended healing period, and may result in scabbing & scarring that you can not prevent. Skin is comprised of the Epidermis layer, the Dermis layer, and the Hypodermis layer. When a tattoo is done properly, it only penetrates into the dermis layer, being the second skin layer. Quality inks are also a factor in how your tattoo heals. Many off-brand Chinese made inks that scratchers buy contain chemicals that are not safe for placing in human skin. Professional tattoo artists know to stay away from those inks for the safety of their client. (Kenny Hill uses only American made inks and has MSDS records for his inks). Everything you need in 1 convienent Tattoo Goo kit! 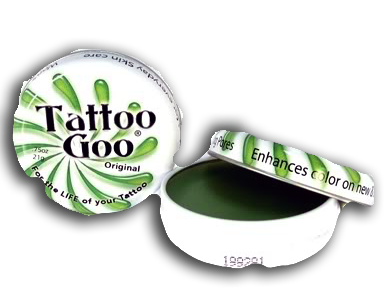 The Original Tattoo Goo Ointment. 100% all natural, contains no petroleum or lanolin. Use during the first week. 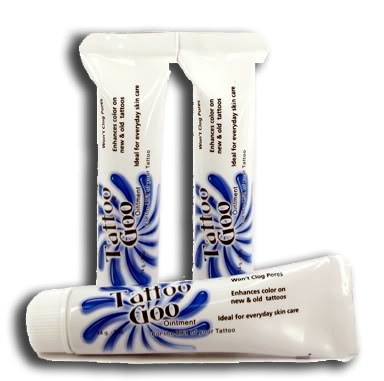 Tattoo Goo Gel Ointment, can be used throughout healing. 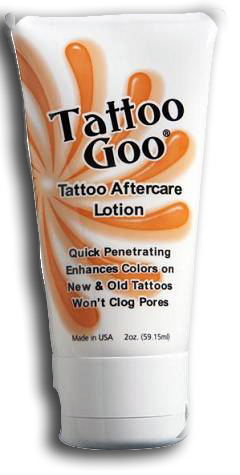 Tattoo Goo Lotion. Can be used throughout healing and on old tattoos to bring them back to life.